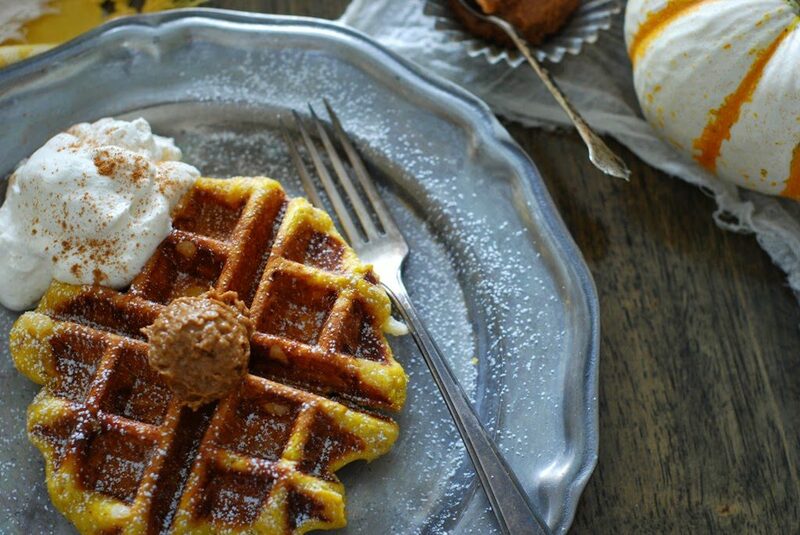 It’s pretty easy to fall in love with a Belgian Liege waffle. The waffles are made from a yeast dough with large pearl size sugar folded inside. The large pearls of sugar melt and form a delicious crunch to these waffles. They are very rich and very addicting. It’s that time of year when I start adding pumpkin into everything I make. 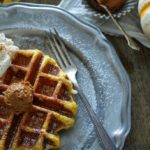 Why not Belgian waffles? 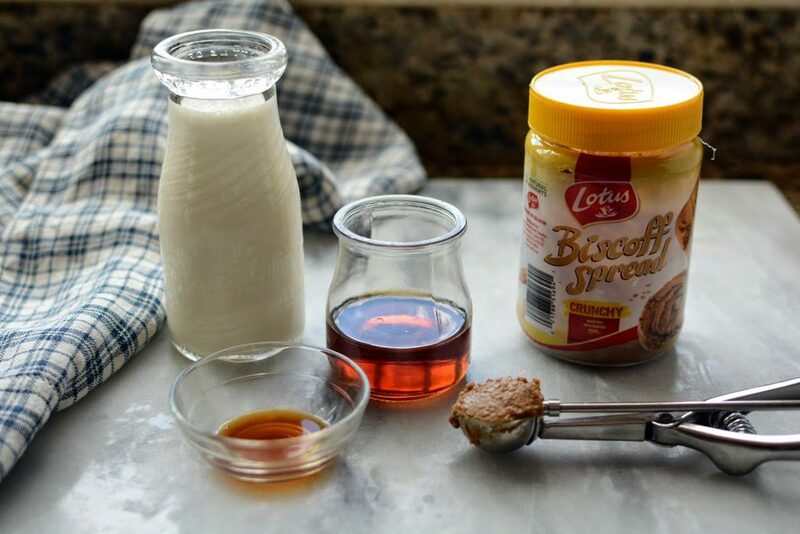 Top with a maple whipped cream and speculoos then say good-bye to that summer bikini bod. Several years ago I had my eye on an amazing waffle iron at Williams-Sonoma. It was pretty pricey and I couldn’t see spending so much. I was strolling through every Williams-Sonoma I passed to see if it happened to be on sale. I finally put the thought out of my head. During this time my husband was shopping for a TV I have to mention that our television was about 20 years old and very dated. He shopped and compared prices. He has lists and lists on a notebook of particular televisions he liked and their price. This went on for months and months. Father’s Day was approaching and I told him that he had look around long enough. I gave him the choice of buying a TV for himself for Father’s Day or I would buy him an expensive waffle iron. I was hoping the threat would encourage him to finally make the purchase. During the week prior to Father’s day I casually walked into a Williams-Sonoma store to find the waffle iron on sale!! I bought it. Father’s day rolled around and my husband still had not decided on a TV. I had not choice but to follow through on my threat. I beautifully wrapped the waffle iron and gave it to him. I can’t begin to tell you how disappointed he was with his gift. Now any other food loving man would have been thrilled. Needless to say, He has since confessed how much he has enjoyed his waffle iron. He has taken it on family reunions and scout “camps” aka “condo camp outs”. We have had many waffle parties throughout or children’s teen and young adult years. He eventually purchased a big screen television and we have enjoyed many waffle creations. 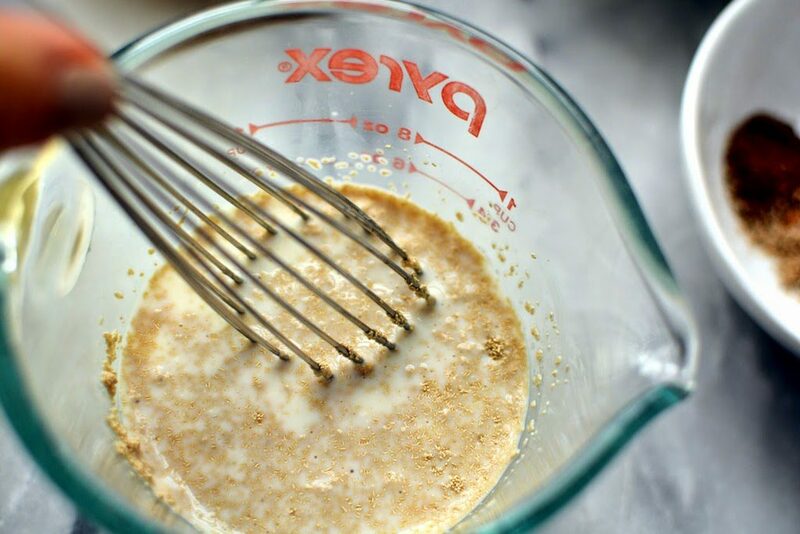 Add 2 1/2 teaspoons yeast to 1/2 cup lukewarm milk. Stir to dissolve. Set aside. 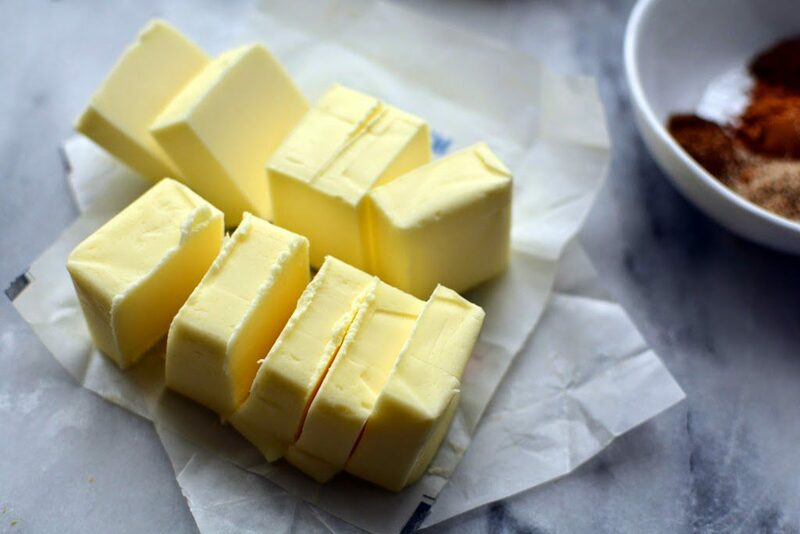 Roughly cut up 2 sticks of butter. 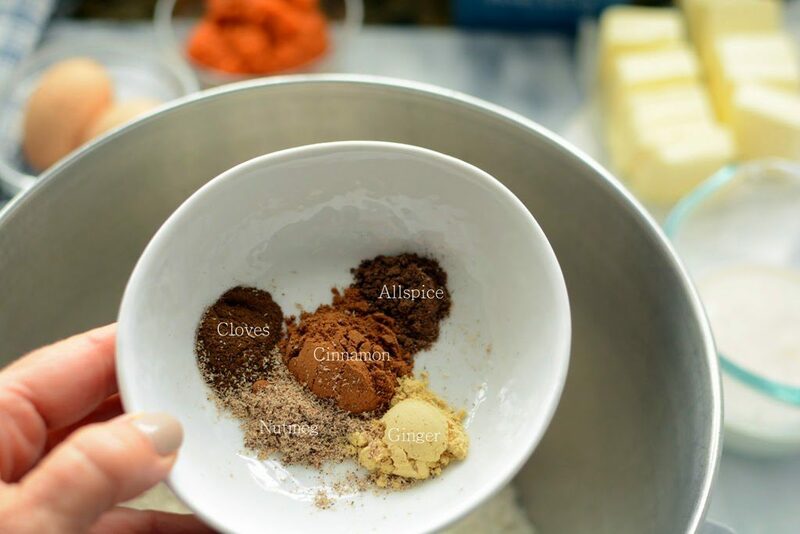 Add the spices: 1 teaspoon cinnamon, 1/2 teaspoon ginger, 1/4 teaspoon allspice, 1/4 teaspoon cloves, and 1/2 teaspoon fresh grated nutmeg. 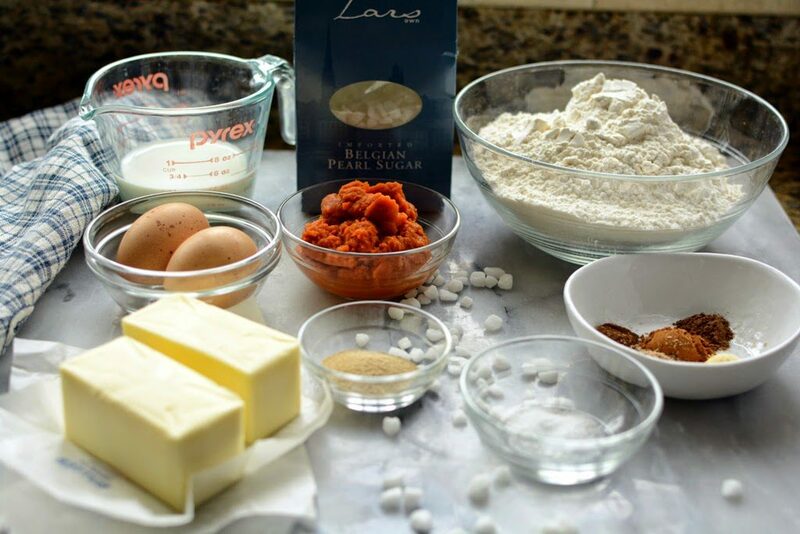 Mix until the butter is incorporated and has a sandy appearance. With the mixer running, add 2 eggs. Add 1/2 cup cooked or canned pumpkin. 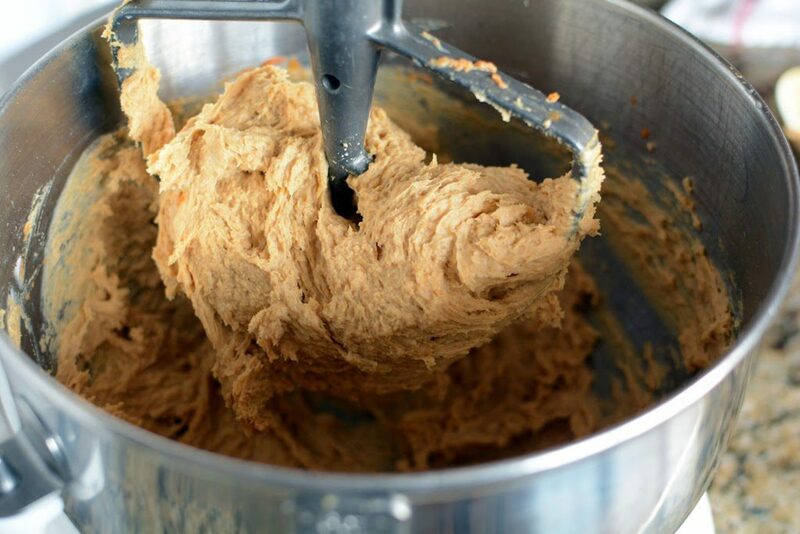 Mix until the dough is smooth and pulling away from the sides. Scrape down the sides of the bowl and form the mixture into a rough ball. 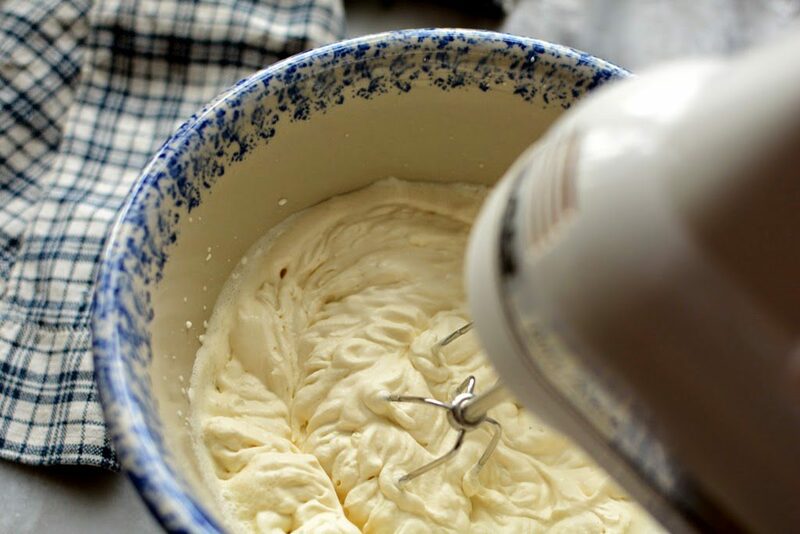 In a medium size mixing bowl, mix together 1 cup cream and 2 tablespoons pure maple syrup. Beat until soft peaks form. Refrigerate until ready to use. Once the dough has risen for 45 minutes, uncover. Add 1 cup pearl sugar. 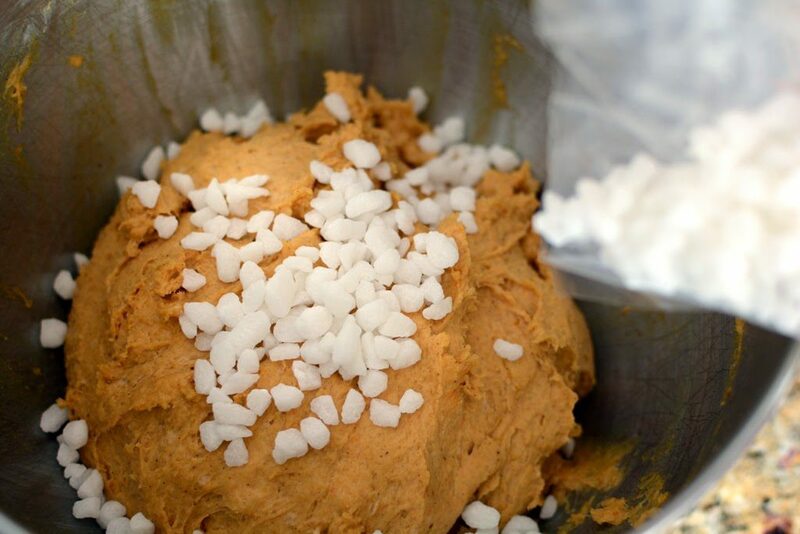 Mix only long enough to incorporate the sugar into the dough. Don’t over mix or break up the sugar. 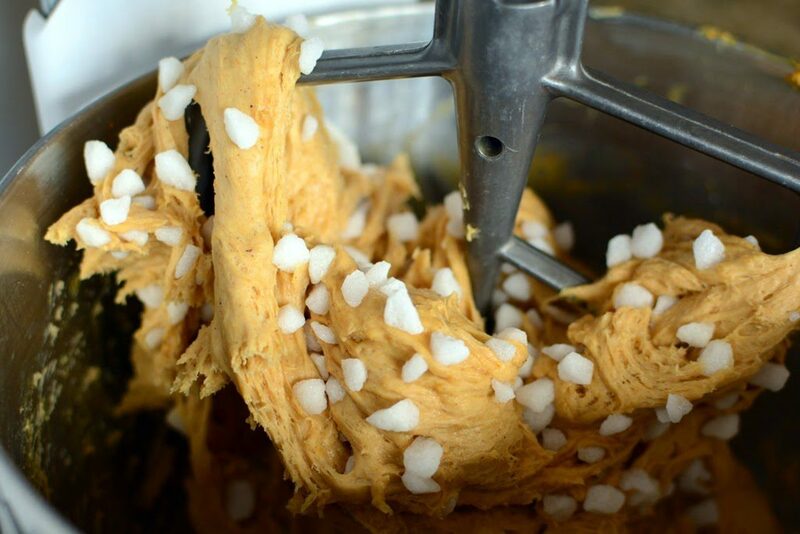 Scrape down sides of the bowl and fold the dough over a few times to mix in sugar. 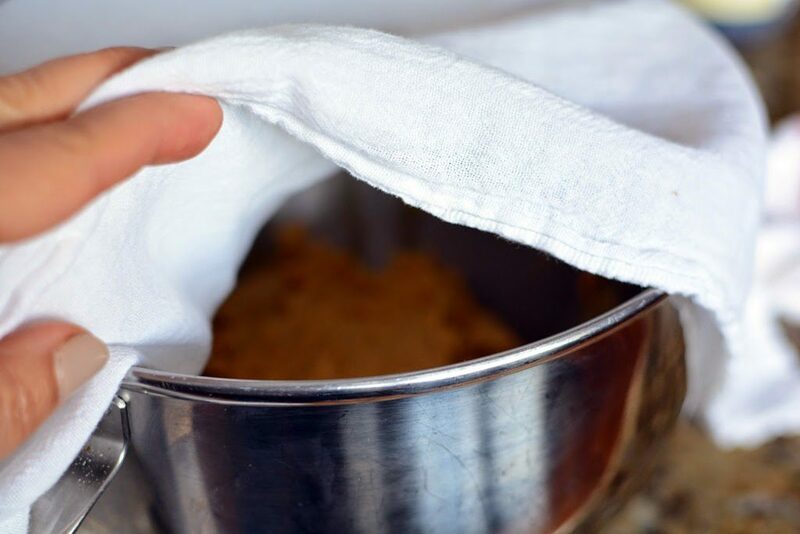 Measure 1/2 cup of the dough and place on a parchment lined baking sheet or silicone mat. Cover and let rest for 15 minutes. If you want to have the dough ready for waffles first thing in the morning, at this point cover with plastic wrap and refrigerate dough overnight. 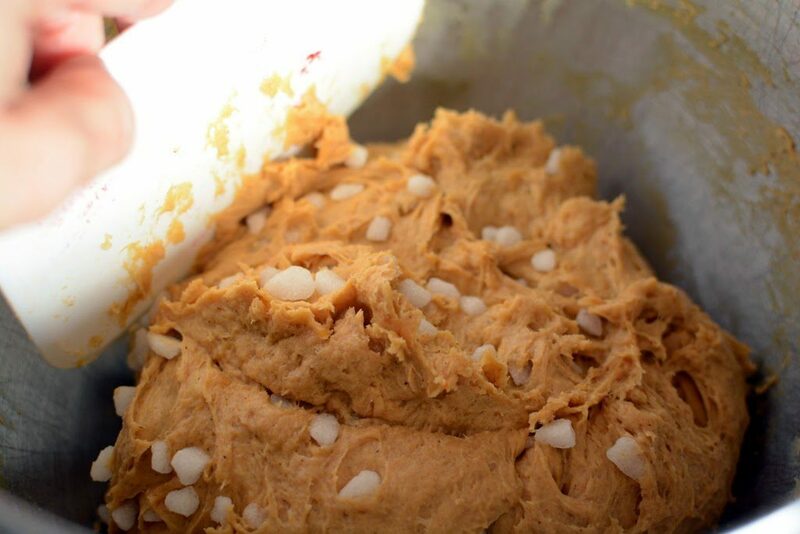 Allow dough to set out at room temperature for 30 minutes prior to cooking. 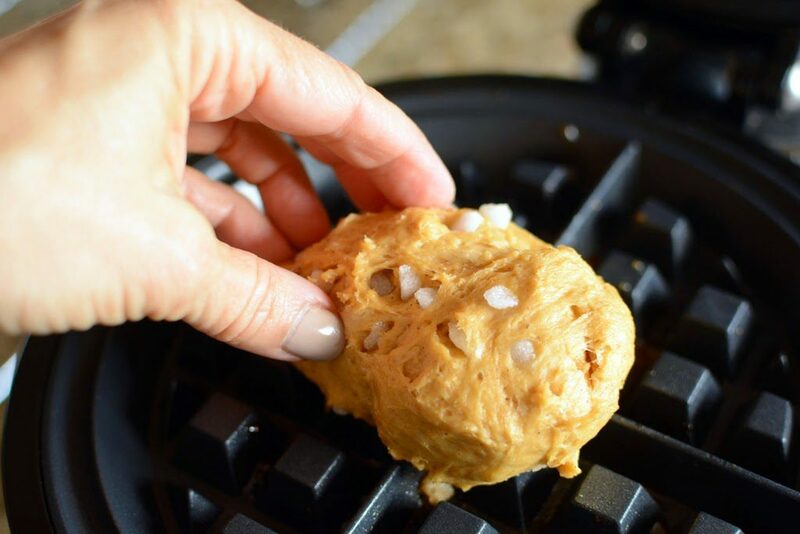 Place just one portion of the dough into the center of the waffle iron. Cook for approximately 3 minutes. Once the waffle is golden brown, remove from waffle iron. Warning: Once the sugar melts it is extremely hot. I use two forks to lift the waffle out. Getting the melted sugar on your skin is like dripping glue from a hot glue gun. It hurts!!!! Please be careful. Place the cooked waffle on a cooling rack to maintain the crisp outer crust. Add a dollop of whipped cream and a scoop of speckuloos. Savor. 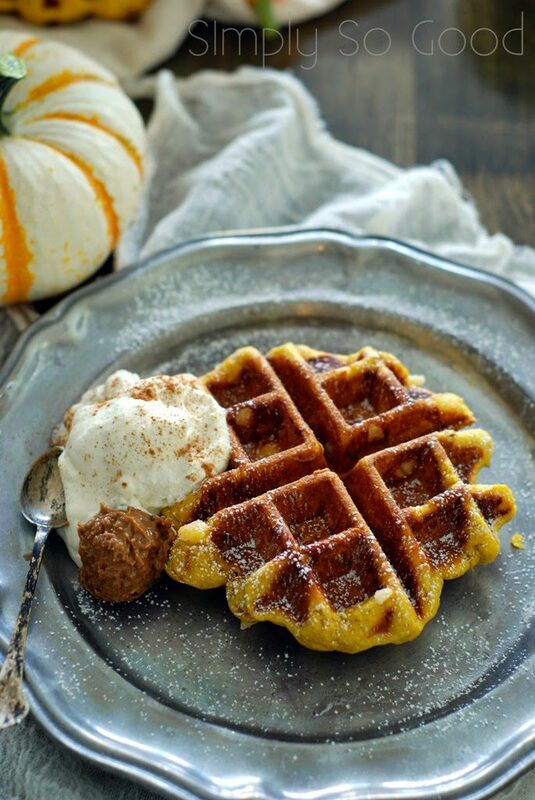 Liege Pumpkin waffles with pearl sugar. 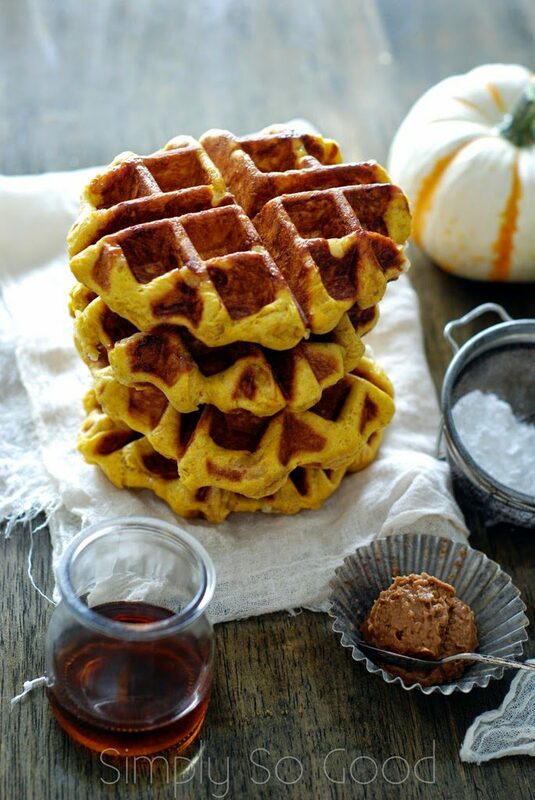 Topped with spiced whipped cream and maple syrup and a scoop of Speculoos or Biscoff spread. Add yeast to the lukewarm milk. Stir to dissolve the yeast then set aside. 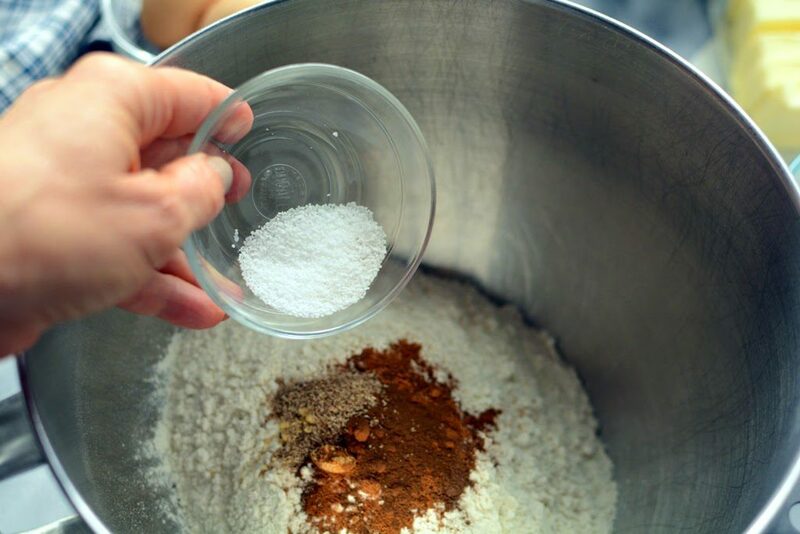 In a large mixing bowl combine flour, salt, cinnamon, ginger, nutmeg, allspice, and cloves. 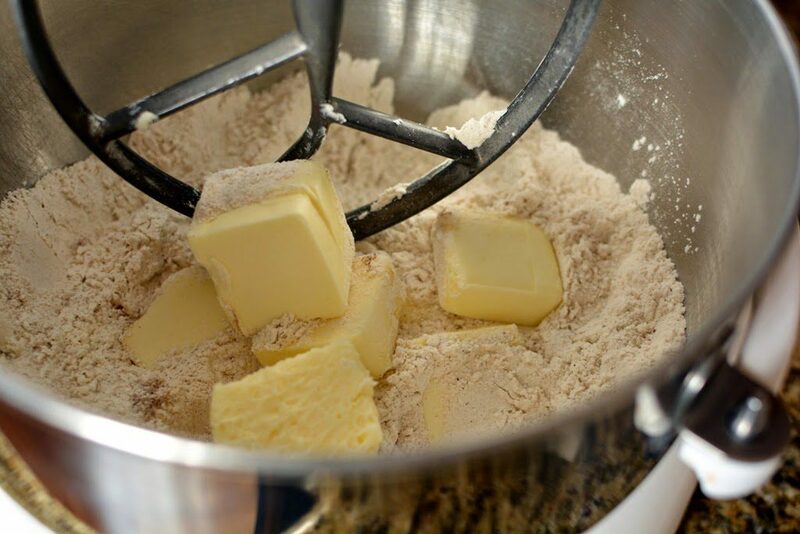 Add softened butter and mix until the mixture is a sandy consistency. 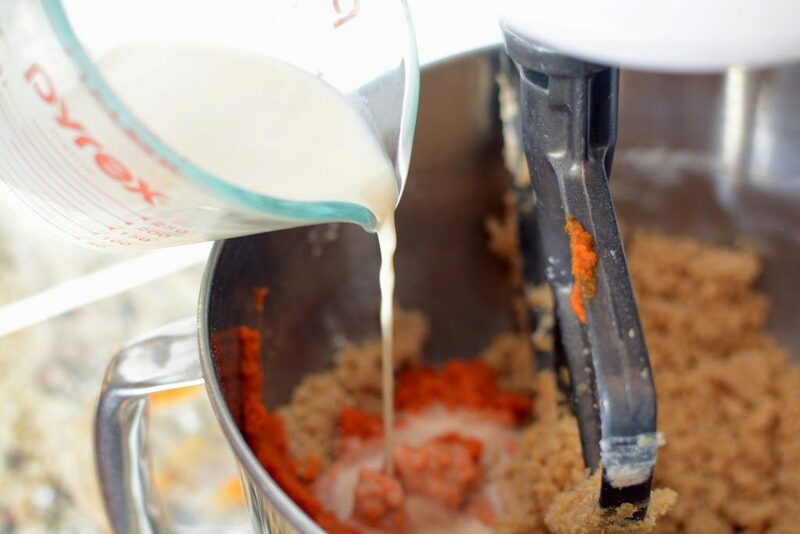 Add eggs, pumpkin, milk mixture and vanilla. 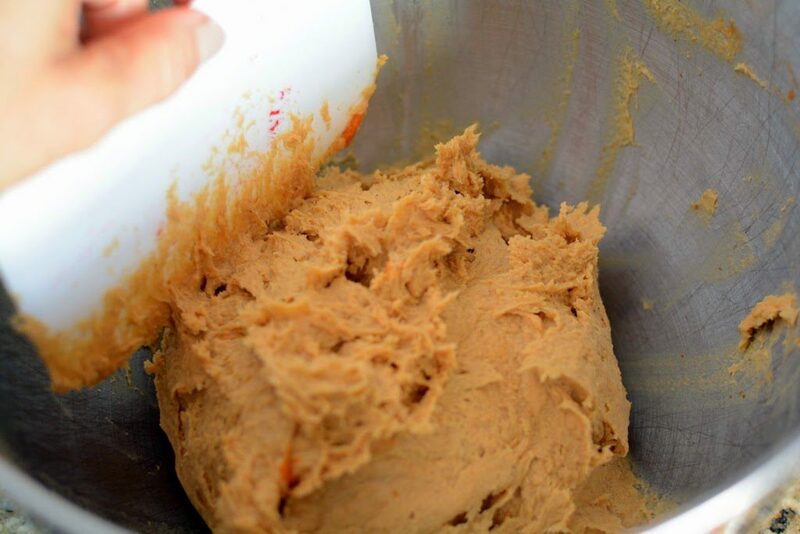 Mix until the dough is smooth and begins to pull away from the sides of the bowl. Cover and let rise for 45 minutes. Mix in pearl sugar and divide dough into 1/2 cup scoops. 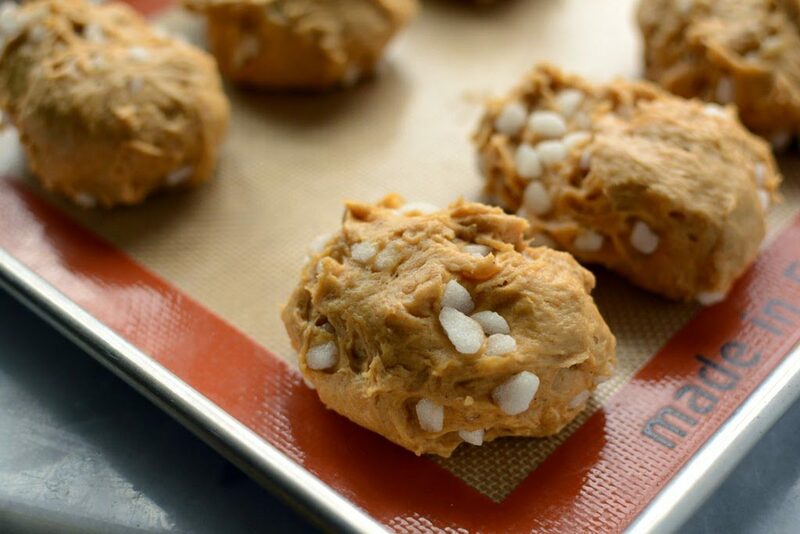 Place on a baking sheet lined with parchment or a silicone mat. Cover while heating waffle iron. 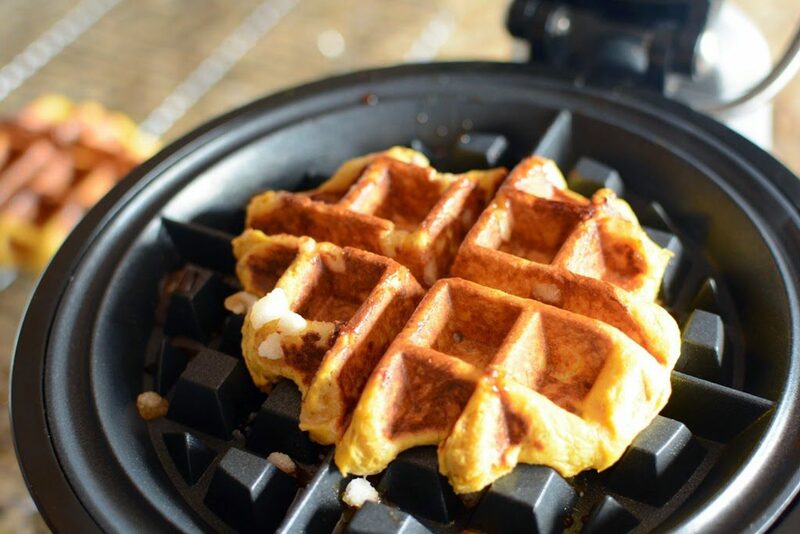 Once the waffle iron has heated place one scoop of the dough in the center of the iron. Cook for about 3 minutes depending on your waffle iron. Carefully remove waffle once the sugar melts it is extremely hot and can burn your fingers. Carefully lift waffle out with the aid of two forks. Top with maple whipped cream and a scoop of speculoos. Makes 9 Belgian waffles. 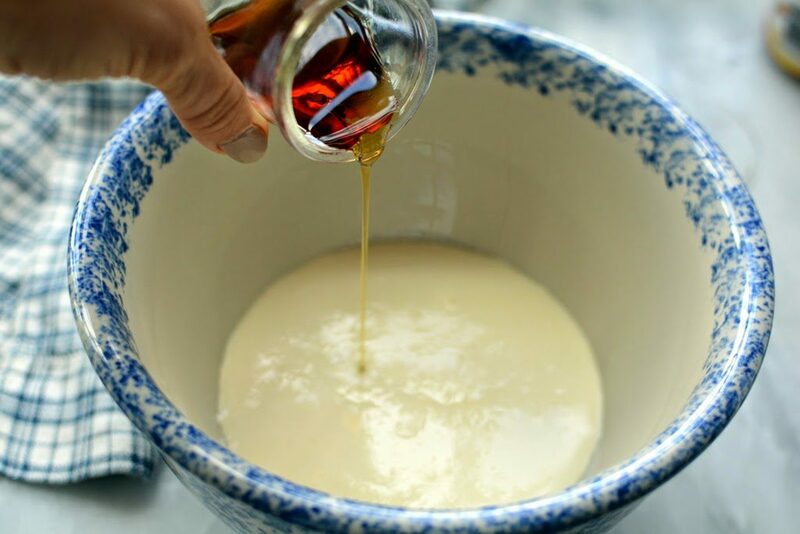 Mix together cream, maple syrup and vanilla in a medium size mixing bowl. Beat until soft peaks form. I have the dough made and in the fridge for Sunday morning, a question…do I grease the waffle iron? I did this recipe last Sunday. I must say the taste is great. My kids left nothing on the plate for us. Such a welcoming comment. You're kids have great taste. Thank you so much. The taste is as awesome as it looks, as awesome as you have made them. Thanks for sharing. Kaitlynn came home raving about your waffles. Is this the recipe you used tonight? Yes and no. I used this recipe but didn't add the pumpkin or spices and used 3/4 c milk. Call me and I can give you the recipe. Thank you for your kind comment, Roseann. My waffle maker is a Kitchenaid. It is a double sided waffle iron that can cook two at once. I love it. I purchased it over about 10 years ago from Williams-Sonoma. How come I haven't found your blog earlier??!! Well, you might be able to hear my ooohs and aaaahs crossing the Atlantic right now. I'll just convert to metric and then get started on your recepies. Fantastic pictures and easy to follow instructions. Hi Anna, you just completely made my day. I'm so glad you found me. I used to convert my recipes, but I was told me conversions were off. So sorry. I need to rethink the idea. Thank you so much for your kind comment. These were amazing!!! I love your recipes!!!! Thanks so so much!!!! Where did you get the pearl sugar? Is there a brand that you prefer? I am excited to make these. I have found it at local grocery stores in Utah. I hope this helps. Thanks, Lori. They are amazing.